Sue Farlinger, regional DFO director (center) speaks to crowd of Heiltsuk community members gathered outside the DFO office on Denny Island, to update on negotiations about the controversial herring fishery on Monday night. Photo by Mychaylo Prystupa/Vancouver Observer. 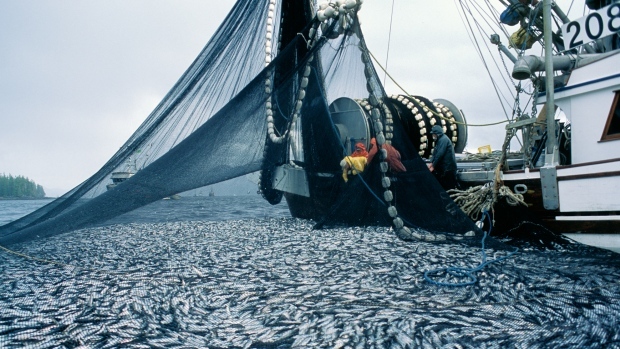 In a stunning reversal, the federal government caved in to Heiltsuk First Nation’s demands to close commercial fishing of herring near Bella Bella in northern B.C. Heiltsuk fisherman Frank Brown speaking to DFO officers on Denny Island on Sunday. Photo by Mychaylo Prystupa/Vancouver Observer. March 29, 2015. 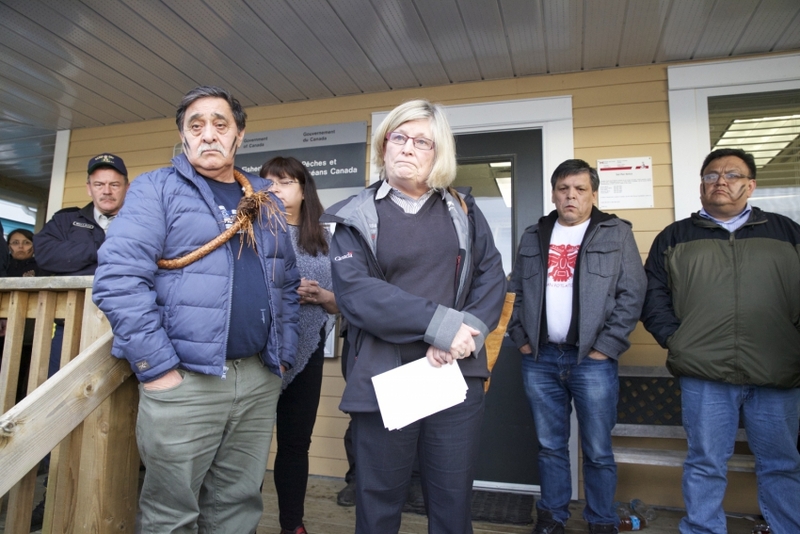 An astonished look came down on Heiltsuk people’s faces when it was announced that Sue Farlinger, Regional Director General Pacific Region, was not flying up Monday morning to negotiate a resolution to the heated herring conflict on the central B.C. coast. Elected chief councillor Marilyn Slett is still locked inside the DFO office on Denny Island, since yesterday evening. 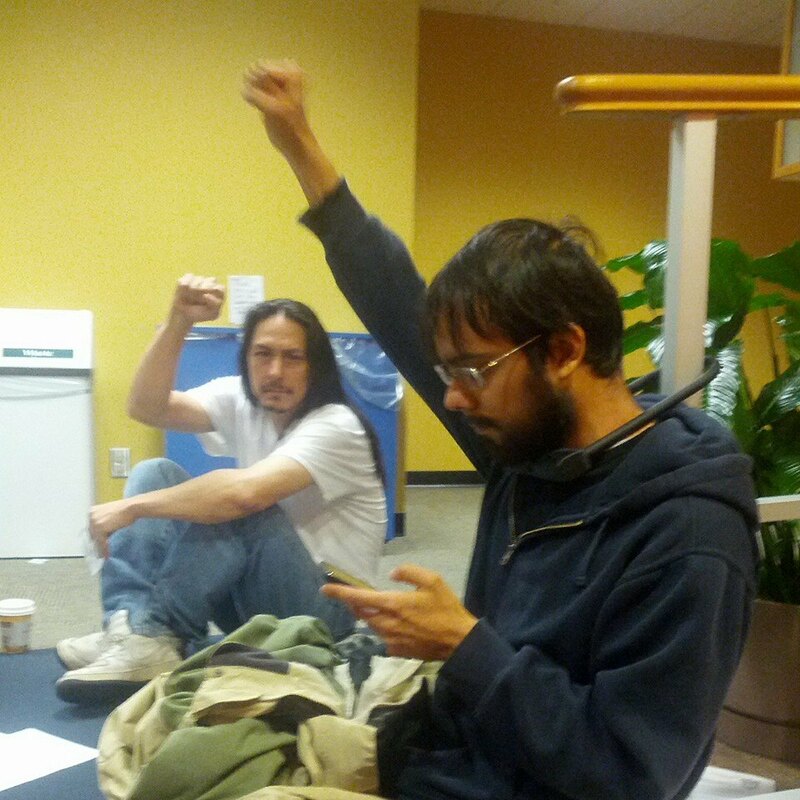 Two of the people participating in the occupation of the Vancouver DFO offices, March 30, 2015. 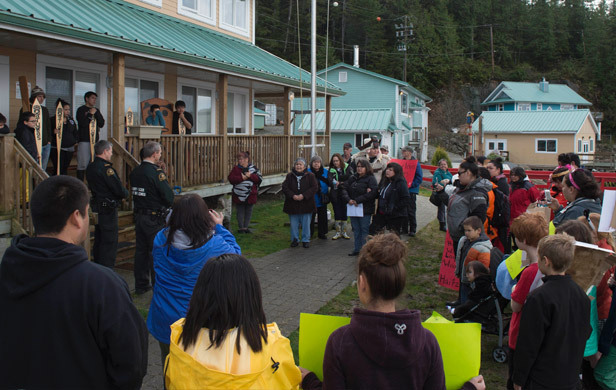 Heiltsuk Nation members confront DFO officers at Denny Island coast guard station (Pacific Wild) via Common Sense Canadian. 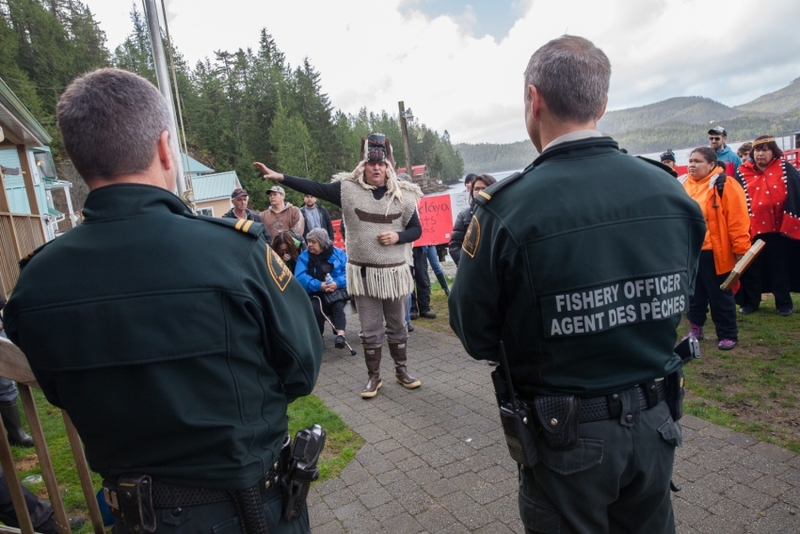 Tensions continue to escalate on the waters of the Great Bear Rainforest over a highly controversial herring fishery, as members of the Heiltsuk Nation are now occupying the local DFO office in opposition to a planned gillnet opening. Heiltsuk woman Carrie Humchitt watches powerlessly as a commercial fishing boat takes in tonnes of herring fish in a disputed fishing area on the B.C. central coast near Bella Bella on Sunday. Photo by Ian McAllister, Vancouver Observer. BELLA BELLA – The Heiltsuk Nation is vowing to protect herring in its territory by any means necessary as it readies boats to defend a contentious fishery on B.C.’s Central Coast. The First Nation has issued a news release saying it met with federal officials about a commercial herring gillnet fishery in its territory Wednesday afternoon but failed to reach an agreement. The Heiltsuk First Nation on B.C.’s Central Coast says when Fisheries and Oceans Canada (DFO) opened a herring fishery on Sunday afternoon it violated the band’s constitutional rights. 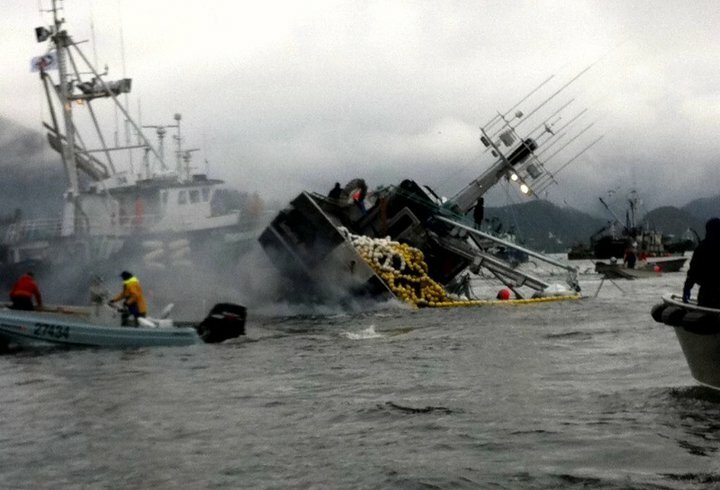 A fishing boat is capsized and nearly sinks after herring caught in the seine net sounded (swam to the bottom), in Sitka, Alaska, April 2011. A federal court has ruled that the Minister of Fisheries and Oceans cannot open a fishery in Haida Gwaii this year. An injunction was given to the Haida Nation, against the federal government, to prevent the re-opening of a commercial herring fishery on the nation’s north coast. 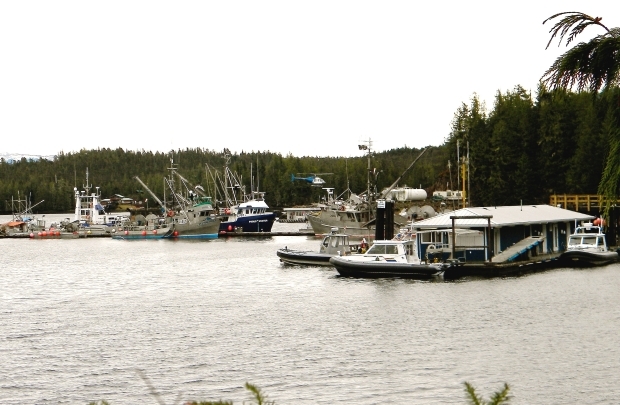 Three RCMP boats parked at docks in Bella Bella, ‘BC.’ as part of their operation against Heiltsuk, March 2014. 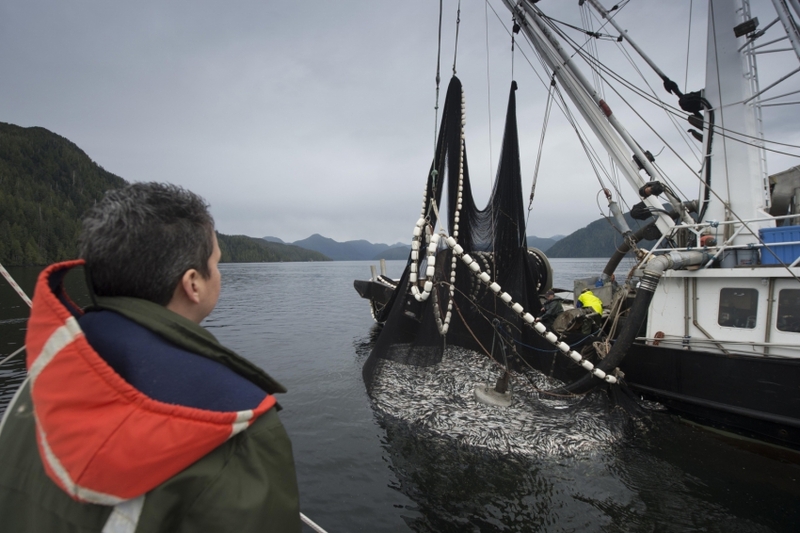 A coastal British Columbia First Nation is claiming a partial victory after federal Fisheries and Oceans officials agreed to keep commercial herring gillnet boats away from waters set off-limits by the community. Tensions are rising on a remote stretch of British Columbia’s Central Coast, where a commercial herring fleet is gathering to fish in an area long closed because of conservation concerns. Federal Fisheries Minister Gail Shea overruled her own staff recently in deciding to allow fishing this spring, but as the opening approaches, First Nations are increasingly demanding that the fishery be called off. 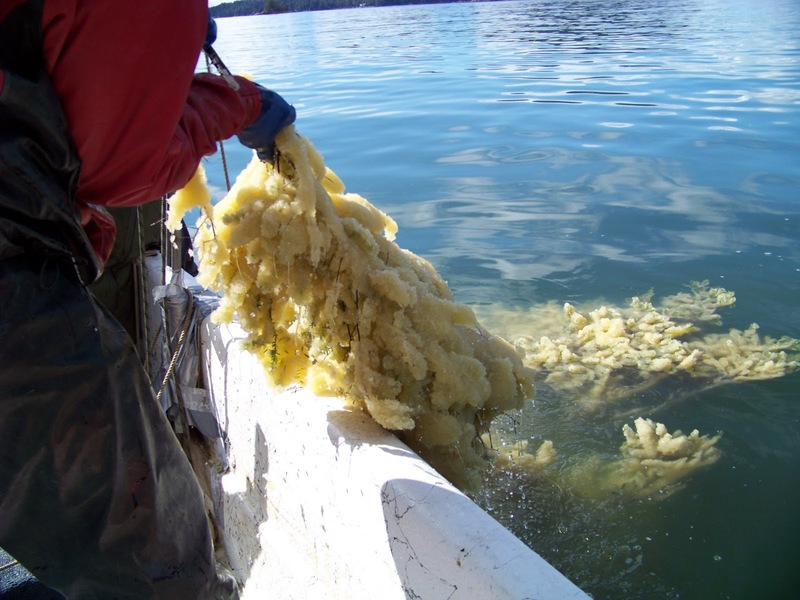 A Tlingit in Alaska gathering Herring roe.